August 3, 2010 (London, UK) – For the first time UK Government agencies now have access to an encrypted USB device designed to tackle head-on the increasing number of threats to Government security. After a rigorous evaluation process, MXI Security’s® Stealth M600 USB flash drive has received official (CAPS) certification from CESG, the UK’s National Technical Authority for Information Assurance. MXI Security is a leader in the encrypted USB and biometric USB drive markets. 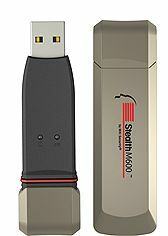 The Stealth M600 includes the Bluefly™ Portable Security Processor, the world’s first dedicated hardware security processor for USB devices, designed to protect against all forms of malware. It features advanced manageability capabilities such as device recycling, while its unique integrated metal enclosure is durable, waterproof, and dustproof. In order to address the growing concern of losing critical data, governments world-wide are implementing stringent rules and regulations with severe penalties in aim to prevent the loss or theft of data when a portable storage device is lost. For example, the UK Parliament recently imposed new penalties for infringements of the Data Protection Act (DPA), which will force organizations to pay up to £500,000 in fines for serious breaches of the DPA..
CESG introduced CAPS to enable private sector companies to develop cryptographic products for use by Her Majesty’s Government (HMG) and other appropriate organisations. Providing independent evaluation that cryptographic products meet Government standards, CESG then formally approves their use by UK Government agencies and the wider public sector. According to a study published by the Ponemon Institute, an independent research firm specializing in privacy, data protection and information security policy, it is estimated that 800,000 data-sensitive devices—including USB drives, hard drives, laptops and mobile devices are lost or stolen each year. Gerard Reusing, MXI Security’s London-based President, says: “We developed the Stealth M600 encrypted USB device specifically to tackle the problem of portable data loss, head-on. The device provides full encryption at all times and cannot be used unless it is unlocked by its legitimate owner. “Having MXI Security receive CAPS certification signifies that the UK Government understands the importance of securing data while maintaining portability. Government agencies and organisations now have access to technology that provides a totally secure way of protecting their most sensitive data.” says Reusing. A pioneer in portable security, MXI Security recently received US Government FIPS 140-2 Level 3 validation for the BlueflyTM Security Processor, which powers MXI’s entire line of portable security devices. Well-established in the United Kingdom with customers including the City of London Police, MXI Security serves the most security-demanding public and private organisations in the world.